Go Chiefs! Otterbox Defender Cases coming this week! Your requests have been heard and your wish is granted! The full protection cases you desire are coming to Mission Repair this week! I’ve secured a U.S. vendor that has all the great accessories you prefer to protect your device and bling out your smartphone or tablet. The Chief’s fans will love the new iPhone 6 case from Otter with the official licensed Chief’s logo on the back. Now it’s easier than ever to show your team spirit for the upcoming 2016/17 season! This is just one of many colors and style choices arriving this week in our Lenexa showroom. We will be adding Spigen, Griffin, Speck, Belkin and many other name brands at competitive prices. Picking up your phone from a recent repair? Ask about our in-store specials and receive a discount on your accessory purchase. Cases, chargers and tempered glass all in store and ready to go! Look forward to seeing you in our Lenexa store! New Mobile Site = launched! Countdown…5-4-3-2-1 and we have liftoff! We just launched our newest version of our mobile site today and I have to say, it turned out great! Now on MissionRepair.com we have updated, innovated, and invigorated our mobile site (that’s the website that you see from your mobile phone) to be easier to use. In fact, we have a complete solution for browsing prices and even checking out on your hand-held device that is easier than ever before. During our website analysis we noticed over 10,000 visitors a month that use a smartphone to view our website were dropping off after the first page. Why were a lot of you doing that? I already know…it’s because our mobile landing page was pretty bad (I admit it) and we have now solved the problem. A special thanks Melanie in the graphics department, she pushed me to make the change happen quickly! So, if you’re reading this blog on a smartphone (like I know a lot of you do), all you need to do now is click this link to see what’s new in the Mission Repair mobile world. It’s refreshing. If you’re not on a mobile device, then you’ll be presented with the same awesome webpage that you’ve come to know and love. Have a great weekend everyone – I’ll be working tomorrow to catch up on a few loose ends here at the office so if you need me you know where I’ll be. 11,000 Facebook likes and climbing! This is my first breath of the day – it’s a rocking Monday here at the Mission Repair headquarters. I thought this would be the calm before the shopping “storm” that’s headed our way on Black Friday and Cyber Monday. Ready – set – get your wallets out because the holiday shopping season is here! Is this exciting news for you? Well, maybe not as exciting as it is to me, but it is a reminder to like us on Facebook so you can get the latest specials and posts that just might be of interest to you. It might even save you some righteous bucks on your next iPad repair. I know for a fact that if you take a cracked iPad to the Genius Bar at Apple, you’ll be spending a heck of a lot more than if you brought it to Mission Repair – and we service the entire country. Web Wednesday Winner ANNOUNCED! Also – take a look at this new special! Hi Friends, and Happy Halloween! Wow, and we are giving away FREE repairs today. You heard right in the video – every 31st order that we receive today, we will wipe all of the charges from the invoice and perform the service for FREE. We are starting at 12:01am from very early this morning and running until 12PM Midnight tonight. On every 31st order placed in this 24 hour window we will remove ALL OF THE CHARGES to celebrate our week of Halloween specials! What’s better than a Snickers bar from the neighbor’s house? 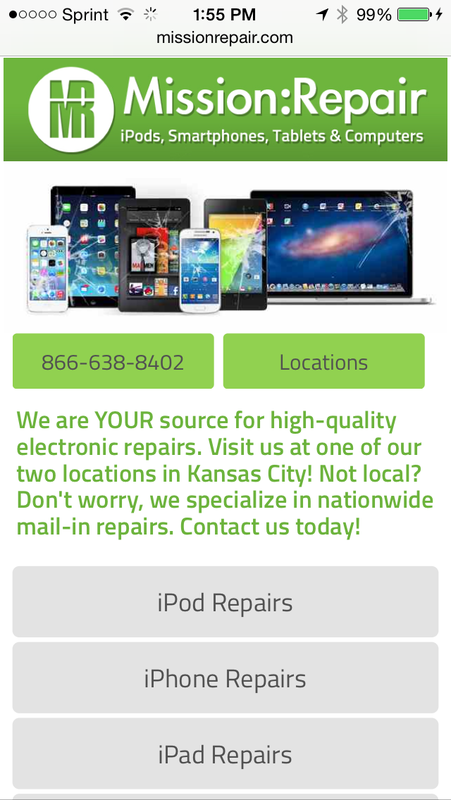 A free iPhone repair from Mission Repair. Or an iPad repair. Or a computer repair. Or a Galaxy SIII repair. Well- I need to stop somewhere. ANY REPAIR THAT WE OFFER is the point! No tricks here ….only treats. Have a safe Halloween and watch tomorrow for the winners of today’s trick or Treat special! Cases, Cases And More Cases! It’s Troy here coming to you remotely from the Harris residence. Its currently nap time and I now have a free moment to breath and talk about our newly added cases that has everyone around the office buzzing! We have added Spigen, UAG and have greatly refreshed our Otterbox offerings! As you can read from Monday, my iPhone 5 is currently donning this Spigen SGP iPhone 5 Case Ultra Thin Air Metal Slate and I am still loving it! I am currently putting the Spigen SGP iPhone 5 Screen Protector GLAS.t SLIM Premium Tempered Glass through its paces and will have a review on that shortly. Ok, that’s enough with all of the links… Now that we have a renewed sense of what it is to offer some awesome accessories, we have got to put the Mission Repair spin on it! Every accessory that we offer will be shipped to you for free! Thats right, why pay more than you have to? Don’t go to Amazon or eBay and pay the random sellers there a dime for shipping! If you are have had a device repaired with us, are currently having a device repaired with us, or know someone that is just clumsy and needs a case, we are here for you! We will continue to add new brands on a weekly basis and if you have any requests for a certain case or accessory, email lennie@missionrepair.com and he will be happy to help!